Micheal Haley, 32, appeared in a career-high 75 games with the Panthers in 2017-18, recording nine points. 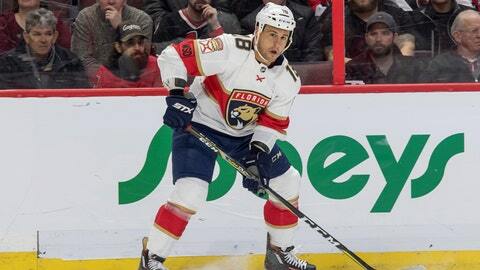 SUNRISE, Fla. – Florida Panthers President of Hockey Operations & General Manager Dale Tallon announced Tuesday that the Panthers have assigned forward Micheal Haley to the club’s American Hockey League affiliate, the Springfield Thunderbirds on conditioning loan. Haley, 32, appeared in a career-high 75 games with the Panthers in 2017-18, recording nine points (3-6-9). The 5-foot-11, 205-pound native of Guelph, Ontario, has appeared in 205 career NHL games for Florida (2017-18), the San Jose Sharks (2014-15 to 2016-17), New York Rangers (2012-13) and New York Islanders (2009-10 to 2011-12), recording 25 points (8-17-25).